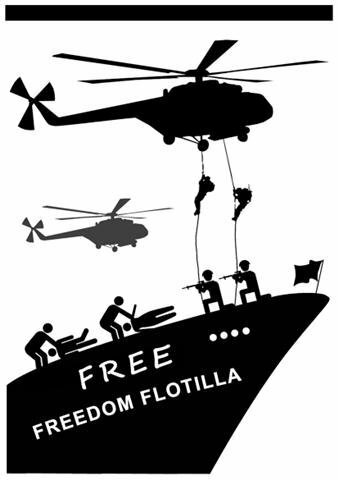 NOLAPS joins our local and global community in outrage over the massacre of humanitarian workers on the Gaza-bound Freedom Flotilla. Below is a brief summary of the story, news sources, and action steps. The international volunteer-staffed Freedom Flotilla that set sail from Cyprus to deliver 10,000 tons of aid to the besieged people of Gaza was attacked in international waters early Monday morning by Israeli war ships and helicopters. Exact details are somewhat scarce, but as many as 20 volunteers have been killed and more than 30 have been injured by live Israeli munitions, as Israeli commandos dropped down onto the ships from helicopters and opened fire on nonviolent peace activists. The UN Security Council has condemned Israel's act of piracy, and NATO has demanded the release of the more than 600 passengers Israel kidnapped at sea. Hundreds of thousands are protesting Israel's actions in cities across the US and around the world, and New Orleans will join them on Saturday. Below are some resources that have offered excellent coverage so far. These news sources are crucial, as more mainstream sources are essentially releasing Israeli government press releases and statements as if they were objective reporting. This news comes on the heels of more devastating developments for the Gulf Coast, where BP has failed yet again to stop the river of oil that is pouring into the Gulf at a shocking rate. The flow of oil may not end until August, and the first tropical storm of what's shaping up to be a deadly storm season has killed more than 115 in Central America. NOLAPS is fully committed to human rights for Palestinians, residents of the Gulf Coast, and all people, including the Right of Return, the Right to Work free of siege and toxic pollutants, and the Right to Self-Determination in safe and healthy communities for all people. The MV Rachel Corrie, which was originally supposed to join the flotilla but was delayed by technical issues that may have been caused by Israeli sabotage (as reported by The Guardian) is now en route to Gaza with the full support of the Irish government, one of its sponsoring countries. NOLAPS joins the global community in demanding that the ship be permitted to dock in Gaza. Additionally, please consider contacting the US State Department to express your concern for the victims of this attack and the 1.5 million Palestinians living under siege in Gaza. Details about the New Orleans protest are coming soon. For the past two days, Democracy Now has featured great coverage of the Israeli Massacre and world response. Al Jazeera English released a video Sunday night, shot by AJ journalists on board the Mavi Marmara, the largest of the flotilla ships. Their site has great reporting on the incident, and also the global protests sparked by the Israeli attack. The Guardian has offered phenomenal reporting and is helping to dispel the ridiculous myth that the Israeli commandos who attacked the flotilla were acting in self-defense. Mondoweiss has great coverage, analysis, and news summaries. Electronic Intifada has news on (re)actions in Gaza, as well as analysis. For up-to-the-minute info, Ali Abunimah's twitter feed and Mondoweiss' twitter feed have been invaluable. Sharine Tadros' twitter feed has a lot of info as well, and you can also always look for local and global updates on NOLAPS' twitter feed. (note: you don't have to be a twitter subscriber to view these feeds). You can also find updates on Free Gaza's website (Free Gaza is the main organizer of the flotilla) and the International Solidarity Movement's website.